After many month of development effort we are pround to annouce the release of Enna v0.4.0. the licence has switched from BSD to LGPLv2.1. packaged for Ubuntu 9.10 (Karmic Koala) users. read the main enna website. Regardless; this release is looking sweet. I bet it uses a tiny amount of resources? Wow, it is looking great and should run faster even on old hardware, kudos to the developers! Is there a way to help with the planned extensions? Is there a prepackaged live cd iso to download, or is the only way to try this right now to install on top of ubuntu or another distro? Enna looks great, but is there any plugin architecture supported? Where can I find documentation or an example about it? I’m actually planning to prepare a couple of plugins for a Mediacenter, and if it’s possible I would like to use geeXbox. Yes there there is plugins in Enna. You can build them inside Enna or have a .so loaded dynamicly. Good to know! However, It will be very helpful to have some manual or example in order to start working on it. BTW, I think it could be interesting to have the option to include scripted plugins (like perl or python), much more easy to port between platforms, and with less stability risks for the entire system. I just tried out the latest version in svn/hg and I must say I am pretty excited on how this project will turn out. Add TV-support and I will install this on my HTPC as soon as it reaches product quality. Keep up the nice work! whoa…. I have seen enna in CVS (now svn) for some time now. This is the first time I have seen in up an going. As the easy_e17 script skipped rage I am assuming that this is not the media center app for e17??? Ok I like it but here is my one question. I am a CEDIA certified home theater installer and I can not live without surround sound. I know how to send commands to mplayer instructing it to utilize alsa to pass through the ac3 and dts audio tracks. I am not familiar with libplayer but I am wondering if the context is the same? Will the same commands that tell mplayer to preserve and not to downmix that beautiful 5.1 track be applicable to Enna? I think that rage is not a full mediacenter app. It’s Raster’s toy. This app is in E SVN to show what we can do with EFL. 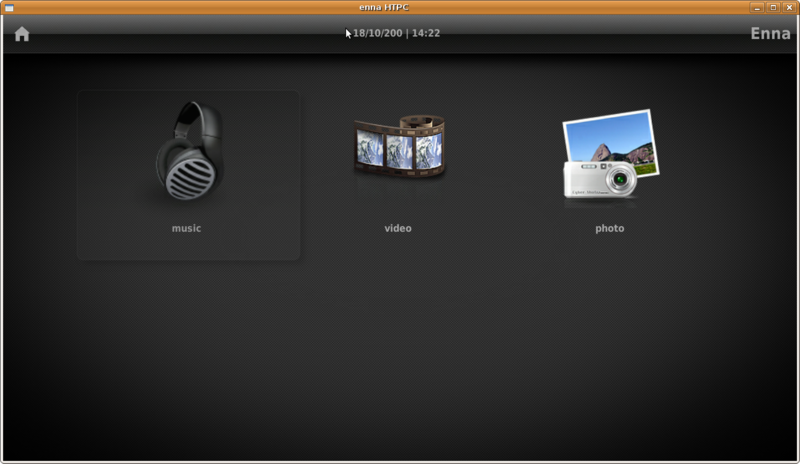 Enna is more a mediacenter app, and is more usefull. For you mplayer question, I’m not 100% sure that what you want to do is possible, but I guess mplayer options are compatible with enna. Mathieu and Ben (libplayer’s authors) could answer better but I think that mplayer options in $HOME/.mplayer are not overrided by enna. So ac3 adn dts track could be play like you do without enna. Enna just embeded mplayer window. If you use emotion as main enna backend, you can’t do this. Just put the configuration in ~/.mplayer/config, the file will be read by MPlayer. I know that it’s a obvious thing for a power user like us 🙂 , but you mistyped the autogen.sh line… it’s “–prefix” instread of “-prefix”. Newbie may be in trouble with this! Just installed… looks very very nice! It’s seems that they are a problem in WordPress CSS. – – are render as juste one -. When you do a copy/paste into terminal, – – are transorfmed in a bad character. I should maybe change the current theme to avoid this kind of problem ! Thanks for this report :). Can someone assist me with this? It’s a bit compilicated to compile enna these days, As i have done some changes, add elementary as have seen. Last week E guys have break some of EFL api so I had to change some part of enna too. Today I think that you should compile without problem. eina, eet, embryo, ecore, edje, elementary, libplayer, libvalhalha, and enna. libvahala is new , but in a very good shape, and developped by Mat. I think that i will blog about this in a near future. oops livalhala can be found on geexbox repository. you have maybe some of them installed in /usr/local/lib ? The root of the problem may be that I haven’t successfully installed the libvalhalla, I’m missing libavformat which I cannot find on the urpmi. Anyone? Enna looks really great, but I get a problem while compiling enna, it tells me there is “No package ‘libvalhalla’ found”. Package libnfo was not found in the pkg-config search path. Error, can’t find libnfo ! See file “config.log” produced by configure for more details. I hope you will help me, I don’t no the way I can get libnfo, when I did sudo apt-cache search libnfo, I got nothing. This lib have been developped by gxben. This lib can access nfo file in your directories. NFO files are a specification from XBMC : . When you added a nfo file in a directory, libvalhalla will read it and add metadata into his main database. Enna read info from libvalhalla dv show them in Enna UI. You can create specific info for personnal content or add metadata that can’t be retrieved automaticly from the web. Currently, metadata from libvalhalla are not in a good shape and and are not displayed in enna ui. We are working hard on this. What I want to achieve is to play video and audio from RTP streams. I played a little bit more with evas and reflection. In my last post I proposed a way to add reflection with Evas. But this code was false. 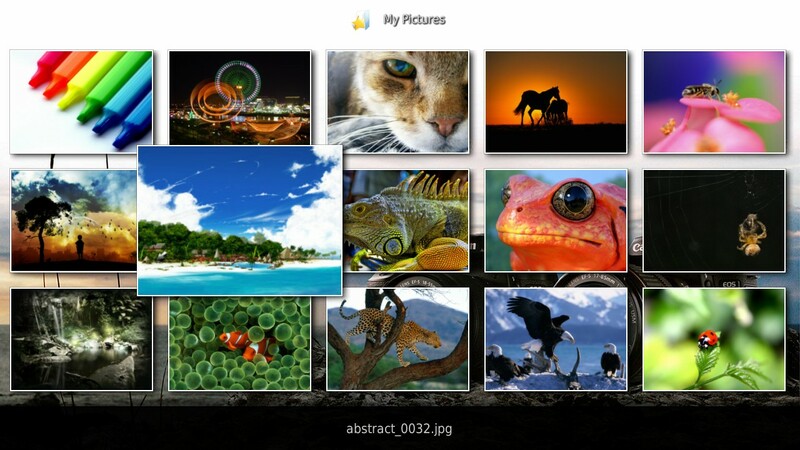 When I copy pixess, I have add a bug. The pixels indexes were false when I flip the image. I have correct this in the new code. I keep sourceforge’s SVN for the moment. Last changes can be found on SVN and I merge the code with CVS one when I have stable code. I’ll do my best to keep enna compiling agains last EFL changes. So if you have troubles compiling or running Enna, please try with CVS sources.